This week, I’ve been lurking around some friends’ kitchen a fair bit, mostly due to not being able to get into my own until yesterday. Some of the meals we cooked up during that time were things I probably wouldn’t have thought of on my own, but I am glad we did. This apple sauce was part of one of them. It’s very simple, and beyond looking up ingredients for a rough gauge of quantity, we didn’t really use a recipe to make it. Nonetheless, here’s one for future reference. 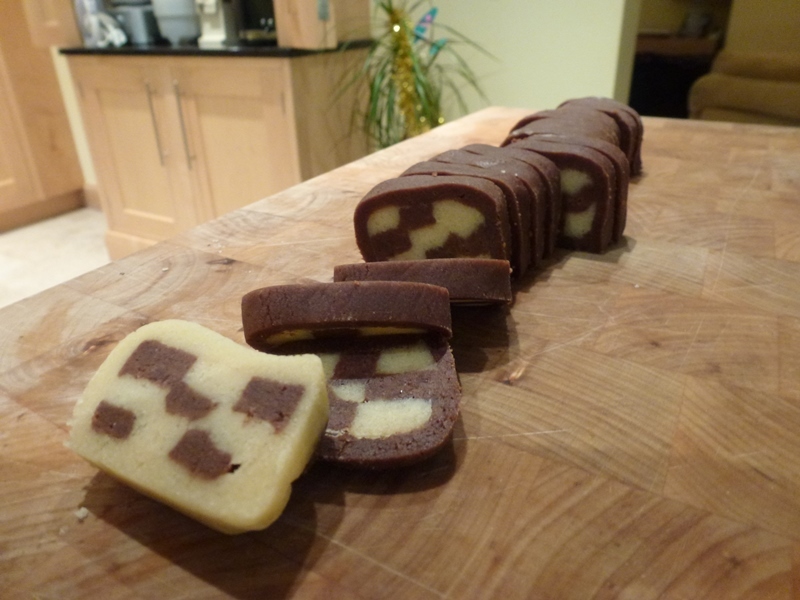 Checkered cookies have been a love of mine for years now, ever since a friend and I made pink-and-yellow ones to mimic slices of Battenburg back in sixth form. I’ve tried to make them a few times since, but as the recipe was in the friend’s recipe book, I’ve had mixed levels of success in recreating them. Over the Christmas break, though, I finally managed to make some that looked and tasted delicious.